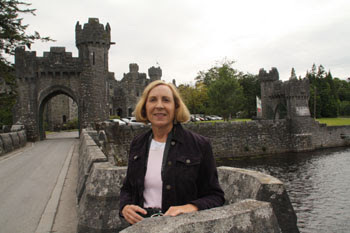 If you love visiting castles while traveling in Ireland, Ashford Castle is the perfect getaway. 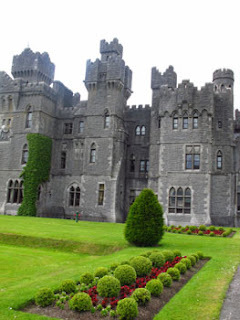 Last owned by the Guiness family (of beer fame) as a private home, Ashford Castle in County Mayo near the western coast of Northern Ireland is steeped in history. Every family that lived there put its own stamp and design on the estate. Today it’s one of the top 50 resort properties in Europe, a five-star hotel featuring a host of on-site activities for guests. 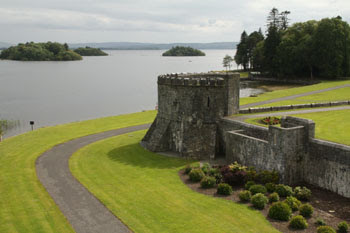 Located on the shores of Lough Corrib and River Cong, the castle opened to the public in 2008 with 83 luxurious, individually furnished guest rooms. Its opulent old-world décor includes sculpted brocade fabrics, voluminous floor-to-ceiling draperies; geometric and floral embroidered chairs and sofas, heavy carved dark wood furniture, and massive gold rimmed mirrors with intricately carved frames. There’s no mistaking its elegant Anglo-Norman heritage, and the royal feeling that envelopes guests staying there. 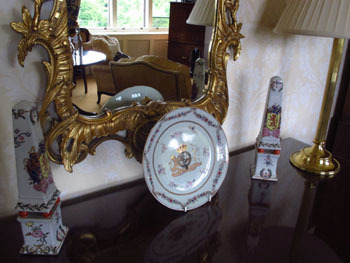 Larry and I were escorted by Catherine to our junior suite filled with mirrors--three large vertical mirrors in the bathroom, a mirror above the desk and another above the dressing table, and several more strategically placed on the walls. We appreciated the American electrical outlets (no adapters needed) and free wi-fi. Throughout our stay, the level of service was superb (clothes left on the bed were hung in the closet during turn-down service later in the evening). Our room looked out over the surrounding lake where a man fished on the bank, ducks swam in the water, and a private tour boat slowly cruised through wavy reflections. In the evening we dined at Cullen’s Restaurant, a little less formal than the main castle restaurant but still excellent. Soon after arrival, we set about exploring the exquisitely manicured grounds. We walked shaded woodland paths lined with thick stands of trees, which created the dark, ominous ambience Irish forests are known for. 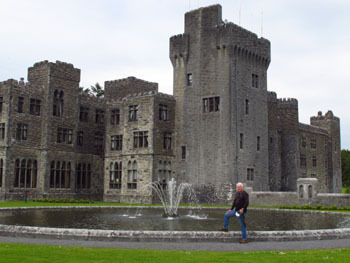 We followed paths meandering through the 300 acres currently in the Ashford Castle grounds. The remainder of the original 3000 acre estate is now government-owned forest land. Golfers enjoy the nine-hole course outfitted with double tee boxes that allow it to play as an 18-hole course. Other activities guests may participate in are spa treatments, horseback riding, and the falconry school. 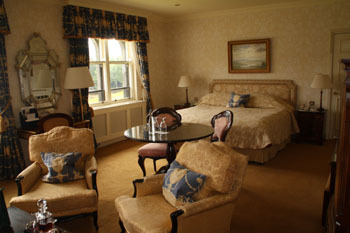 Ashford Castle provides plentiful sitting rooms for card games, conversation, or sipping a glass of wine. Browse at the Castle gift shop, view art displays in the Castle, or watch complimentary movies in-room such as The Quiet Man, the classic 1952 film starring John Wayne and Maureen O’Hara which was partly filmed here. Best of all is the opportunity to absorb serenity, beauty and history of the setting. 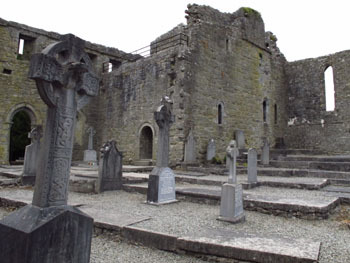 Soon after our arrival, Larry and I needed to stretch our legs, so we took a five-minute walk into the tiny village of Cong to see the abbey built on the site of a sixth century monastery. Cong also has a museum commemorating The Quiet Man film, local shops featuring gorgeous woolen sweaters, and the friendliest people. My advice: Leave the kiddos at home and enjoy a romantic, relaxing adult retreat.